Invasive alien aquatic plants (IAAPs) cause a serious threat to freshwater ecosystems. On January 1st, 2015, an EU regulation came into effect, which regulates the introduction and management of IAAPs, with the aim of rapid eradication of already present IAAPs. In June 2016 a species list of union concern was published, listing seven IAAPs, three of which (Hydrocotyle ranunculoides, Myriophyllum aquaticum and Ludwigia grandiflora) are part of this project for potential biomass use. In addition the fourth species of this project (M. heterophyllum) will be most likely added to the species list in 2017. The populations of these four species in NRW were mapped in 2016 and biomass samples were taken for further analysis and the total biomass per water body was calculated. M. aquaticum was found to be the most widespread IAAP in NRW in 2016, and several new infestations were reported within this project. In contrast, the population sizes of M. heterophyllum decreased within the last ten years, and formerly dense populations of this species, e.g. in Lake Schluchtsee (with biomass densities of >3kg of DM m-2 in 2005) became almost absent. For Hydrocotyle ranunculoides, strong fluctuations in population sizes and biomass densities between the years were documented, and during summer 2016 only small infestations were found. However, for the successful eradication of these populations, which are required according to the EU Regulation 1143/2014, early action and the selection of the management method must be based on habitat characteristics and species attributes. During the field work within this project, local authorities were advised (on their demand) in eradicating e.g. M. aquaticum, and the side-aspect of invasive plant management within this project became a valuable contribution to this new field of work for local authorities and water boards. For the most widespread species in 2016, M. aquaticum, average biomass densities in June 2016 of about 1.08 kg DM m-2 (approx. 11 kg FM m-2) were found, which increased slightly to a maximum of about 1.6 kg DM m-2 in September / October in a pond in Geldern and a river system in Kranenburg. The characterization of M. aquaticum showed that the plant composition strongly depends on the harvest location. With together 40 %, glucans and extracts make up the largest proportion of the composition. The flavonoids quercetin and rutin could be identified in the examinated extracts by using high resolution LC-MS. In order to investigate a potential utilization in a biorefinery process IAAPs were hydrolyzed enzymatically. In contrast to untreated beech wood the obtained sugar yield for M. aquaticum was 1.26 times higher due to the higher amount of amorphous polysaccharides. The total budget of AquaPro is € 128.683. AquaPro is part of the NRW-Strategieprojekt BioSC and thus funded by the Ministry of Innovation, Science and Research of the German State of North Rhine-Westphalia. Hussner, A, Stiers, I, Verhofstad, MJJM, Bakker, ES, Grutters, BMC, Haury, J, van Valkenburg, JLCH, Brundu, G, Newman, J, Clayton, JS, Anderson, LWJ and Hofstra, D (2017). 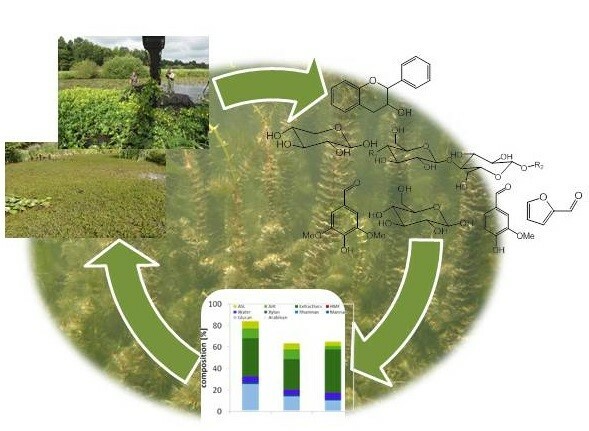 Management and control methods of invasive alien freshwater aquatic plants: A review. Aquatic Botany 136: 112-137.